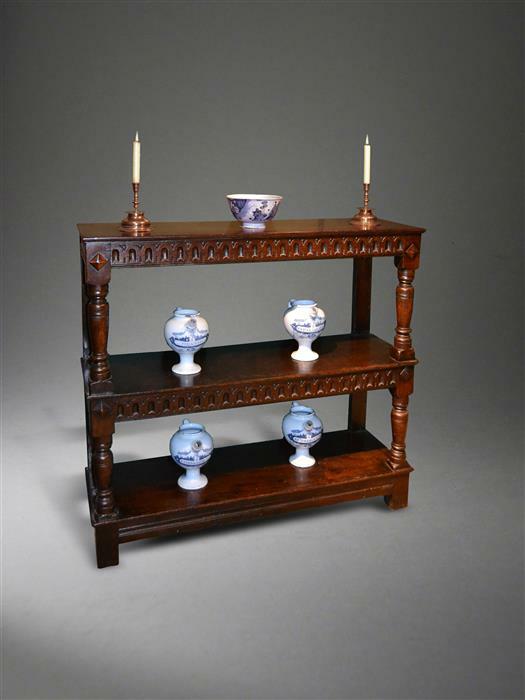 Suffolk House Antiques | A mid 17th century oak three tier buffet. A MID 17TH CENTURY OAK THREE TIER BUFFET. This elegant three tier buffet was bought a few years ago from a good collection of oak in a local farmhouse and sold to a customer in Cambridgeshire. I have now taken it back in part exchange for a painting and it is available at a very reasonable price. It has carved nulling to the two upper rails, baluster turned uprights and excellent colour. On the back it has a label, probably from the 1930s, which reads "James Reeve, Birmingham, antiques dealers for nearly one hundred years." It has had some restration but is a very attractive piece of early oak and is priced at £2950.